This mission is dedicated to the Entrance of the Holy Theotokos into the Temple, one of the 12 Great Feasts of the church year. Being placed under the protection of the Theotokos (God-bearer) Mary, we entreat her to remember each of us in her holy prayers. 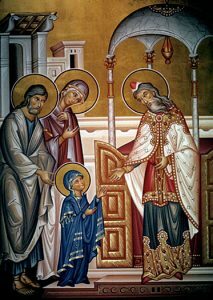 The Entrance of the Theotokos into the Temple is celebrated on December 4 (November 21 OS). It is sometimes referred to as the Presentation of Mary. The details of the Entrance of the Theotokos are recorded in the ancient writings of the first Christians, particularly in the Protoevangelium of James, which was written before the year 200 A.D. The Theotokos was presented to the temple in a procession of virgins with lighted tapers in their hands. The three-year-old Most-holy Virgin, led by her father and mother, was clad in vesture of royal magnificence and adornments as was befitting the “King’s daughter, the Bride of God” (Psalm 44:13-15). Following them were many kinsmen and friends, all with lighted tapers. Fifteen steps led up to the Temple. Joachim and Anna lifted the Virgin onto the first step, then she ran quickly to the top herself, where she was met by the High Priest Zachariah, who was to be the father of St. John the Forerunner. Taking her by the hand, he led her not only into the Temple, but into the “Holy of Holies,” the holiest of holy places, into which no one but the high priest ever entered, and only once each year, at that. Zachariah “was outside himself and possessed by God” when he led the Virgin into the holiest place in the Temple, beyond the second curtain—otherwise, his action could not be explained. The Most-holy Virgin remained in the Temple and dwelt there for nine full years. While her parents were alive, they visited her often. When God called her parents from this world, the Most-holy Virgin was left an orphan and did not wish to leave the Temple until death or to enter into marriage. The Most-holy Virgin Mary was the first of such life-vowed virgins, of the thousands and thousands of virgin men and women who would follow her in the Church of Christ.